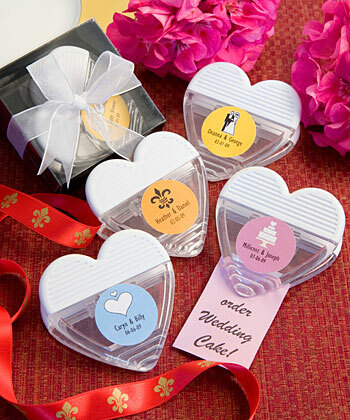 These useful memo clips favors are all heart and your guests are sure to be impressed by the personal flair they add to your wedding, shower, anniversary or any other special event. Each heart shaped Personalized Expression Collection favor from Fashioncraft measures 2 ¾” long x 2 ¾” wide and is made of clear Lucite with a white ridged top and a magnet back to affix to the refrigerator. The heart’s center is fit for easy application of the personalized label of your choice. From assorted color combinations, to seasonal and themed designs, to your own title, you design the eye catching label that suits your style! Each comes packaged in a clear topped box with a black base, finished with an attractive white organza bow, along with self sticking label sheets for you to apply. Please allow 3-4 days for production. Due to personalization, you must order at least 36 favors. View colors and designs for free personalized labels.